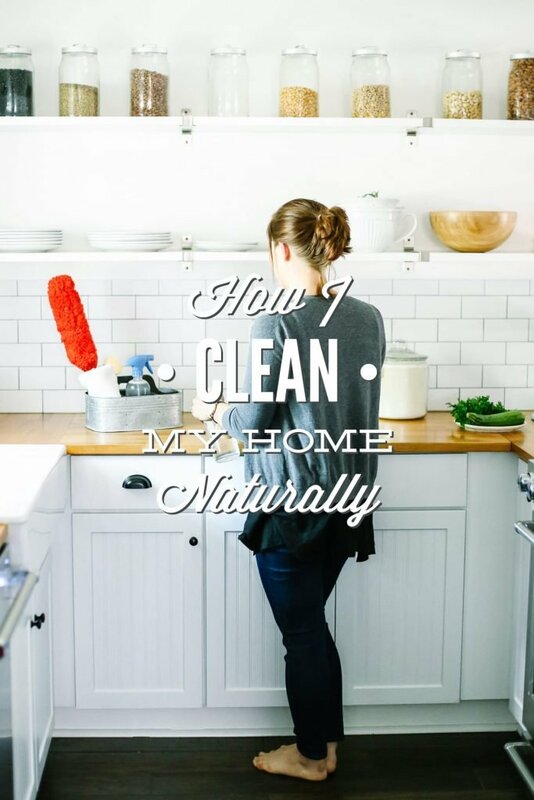 After sharing a multitude of cleaning recipes both here on the blog and in the DIY Natural Cleaning Challenge, it’s time to piece each recipe together and talk about what natural cleaning looks like in my home. Today’s chat is intended to be a sneak peek or mini tour showcasing what I’m currently using to clean my home. During our tour, I’ll share about the main areas in our home, and the products I use to clean each area. As we talk about the products I use, I’ll place an asterisk next to the product if it’s currently used in multiple areas of the house. I spend a ton of time in my kitchen due to work responsibilities for the blog and freelance projects (testing and retesting recipes) and feeding my family. My kitchen is definitely my number one priority when it comes to cleaning. Our kitchen features sealed butcherblock counters, open shelving, white bottom cabinets, a ceramic farm sink and subway tile back-splash, and stainless steel appliances. 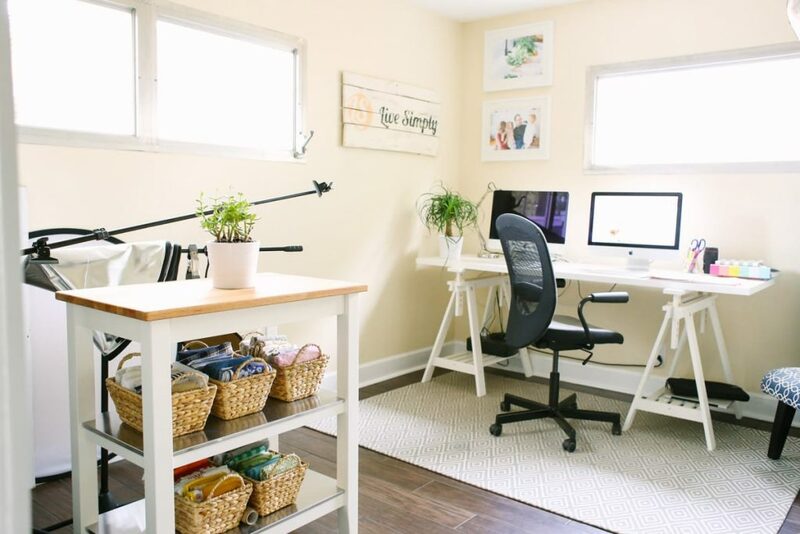 It’s a small space that receives a lot of daily attention. Our dining room overlooks the kitchen area, so I’m also including this room in the “The Kitchen” category. Our dining room is a simple space with a white dining room table and chairs and a coffee bar. I go between using the vinegar cleaner and the castile soap cleaner, depending on which ingredient I currently have in my pantry. Personally, I prefer the vinegar cleaner since it also works great on my stainless steel appliances, dusting the open shelving, cleaning counter-tops, disinfecting the sink, and degreasing the stove-top. This cleaner definitely lives up to its all-purpose title, since I use it on just about every surface in my kitchen, including my dining room table. My oven is dirty 99.9% of the time. My oven is more of a commercial oven at this point, along with my kitchen, due to the amount of recipe testing and photography work that comes out of this appliance (and the space) on a daily basis. I try to clean it at least every three months, just to keep it from getting so bad that I don’t want to open the door when guests come over. A baking soda paste has been the best solution for my oven since it’s tough on grease. My favorite dish soap recipe isn’t on the blog, but can be found in my cleaning book (1/2 cup water + 1 tablespoon white vinegar+ 1/2 cup Sal Suds + 1 tablespoon moisturizing oil: jojoba, sweet almond, or olive oil. Simply combine all the ingredients in a pump bottle). I keep this soap in a glass soap dispenser next to my sink and use it for both hand-washing and dish-washing. Dishwasher detergent is a product that I currently choose to purchase from the store. (Remember our what to make versus buy chat a while back?) The best “more natural” store-bought product I’ve found is Seventh Generation’s Powder Dishwasher Detergent. Most of the time I simply use a lemon cut in half to clean my sink. It’s amazing how such a simple ingredient makes my white sink sparkle and shine. After washing the dishes, I rub the lemon over the surface of the sink (sometimes with a bit of salt sprinkled on top). If the sink needs a deep clean, a generous sprinkle of toilet bowl cleaner powder and a scrub brush washes away any grease or dirt buildup. Next up, our bathrooms. Our home was built in the ’60s, and just from observing the size of our bathrooms, it’s clear that builders and homeowners didn’t feel like having room for more than one person at a time was important. Our bathrooms are super small, poorly ventilated, and one is bright pink. Our bathrooms are about to go through the remodeling process this summer, like our kitchen did last year (it’s a real life Fixer Upper show around here, just without Joanna and Chip). Right now, we have one full bathroom with a tub and shower, and a half bathroom. The full bathroom definitely demands the most cleaning attention. As mentioned earlier, I go between using the vinegar cleaner and the castile soap cleaner, depending on which ingredient I currently have in my pantry. I use this spray on our tile walls, counter-tops, in the sinks, and around the toilets. This scrub is awesome, and it’s perfect for a dirty tub. For routine cleaning, I stick with my all-purpose spray (above) in our tub, but when the tub needs that extra something (once a month), this tub scrub is my go-to product. At the moment, I don’t make the full recipe; rather, I cut the recipe in half for a one-time use. Our full bathroom mirror is a toothpaste splatter magnet. This glass cleaner is the perfect solution. I also use this glass cleaner to clean the windows in our home. Mildew is a huge issue in the shower of our full bathroom due to poor ventilation. This issue will be fixed with the upcoming remodel. For now, I use a simple vinegar mildew spray every few days to keep the mildew from taking over. This is the same powder I use to occasionally deep clean my kitchen sink. I sprinkle this powder in my bathroom sinks and the toilets. In the sink, I simply scrub the powder over the surface and then rinse it off with water. 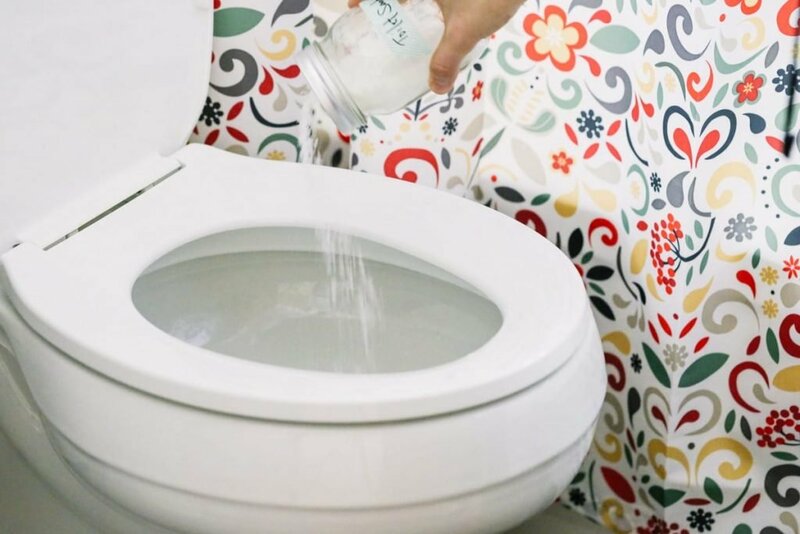 In the toilet, I sprinkle the powder inside the toilet bowl, let it rest, and then scrub the bowl with a toilet bowl brush. I’m going to lump the rest of our home into this giant “General House Cleaning” category. The rest of our home consists of four bedrooms, technically we use two as bedrooms and two as office/studio rooms. The bedrooms are filled with your average bedroom/office stuff: desks, beds, and dressers. We have a cozy living room with white slip cover couches, a built in bookshelf, a few wood furniture pieces, a gallery wall of photos/typography, a cream jute area rug, and a giant white armoire. Throughout our entire home we have a mix of “hardwood” tile and carpet. I’m currently using a simple blend of castile soap, hot water, and a few drops of essential oil to mop our “hardwood” tile floors. I only mop our floors every two weeks with a microfiber mop (and the castile soap solution), and I sweep daily. Our carpet is vacuumed every two weeks as well. I also use this cleaner with a microfiber cloth to clean our baseboards. I love my washable duster, and use it to dust everything from fans to air vents. When I need a spray cleaner, I use a simple blend of castile soap and water for a homemade dusting spray. We have a white (slipcover) couch and chair in our living room. We also have two kids and two dogs. Enough said. Sometimes a stain remover is needed. Most of the time, just a spritz of 100% hydrogen peroxide or vinegar will remove a stain. But sometimes, I’ll make a bottle of easy stain remover. I don’t keep this stain remover in my cleaning toolkit, because I don’t need it regularly, but I always have the ingredients on hand. We have two little dogs, which means I’m constantly concerned that our house smells like dogs live here (because they do!). Once a month, I sprinkle baking soda and a few drops of essential oil over our rugs and carpet, let it rest for 30 minutes, and then vacuum away any odors. I use this window cleaner (the same recipe used in the bathroom for mirrors) to help our windows sparkle and shine. 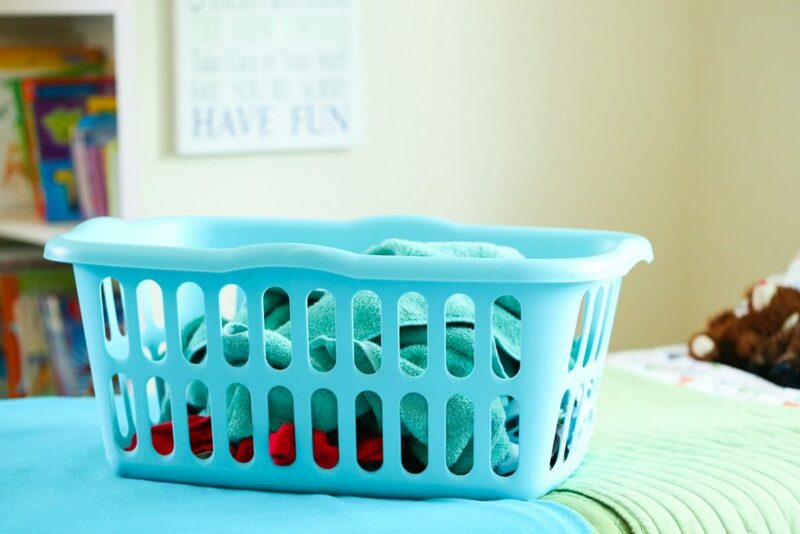 Eventually, just about anything that can be washed in a tub of water will find its way into my “laundry room.” I don’t have an actual room for laundry in our home, but let’s just stick with the idea. Our washer and dryer are vintage (that’s a nice way to say older in 2016, right?! ), and they work very hard to keep our family happy and clean. Depending on our current season of life (travel, work projects, etc. ), I go between “more natural” store-bought laundry detergent and homemade laundry soap. Right now, homemade laundry soap powder is sitting on my washing machine. This powder is amazing–it cleans and deodorizes! I’m not a crafty person, and I definitely can’t sew anything, so homemade dryer balls (made from wool) really intimidated me at first. I finally decided to try making a batch, and I’m so glad I took the risk. They are super easy to make. I use my dryer balls in place of dyer sheets. 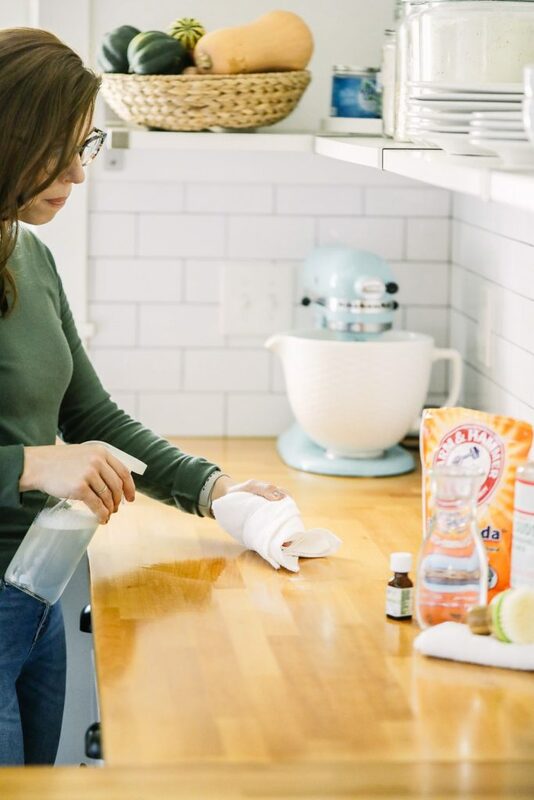 It may seem like I make and use many different cleaning products in my home, but when you look at each product, you’ll also notice that many of the ingredients are the same (just with different combos or ratios). 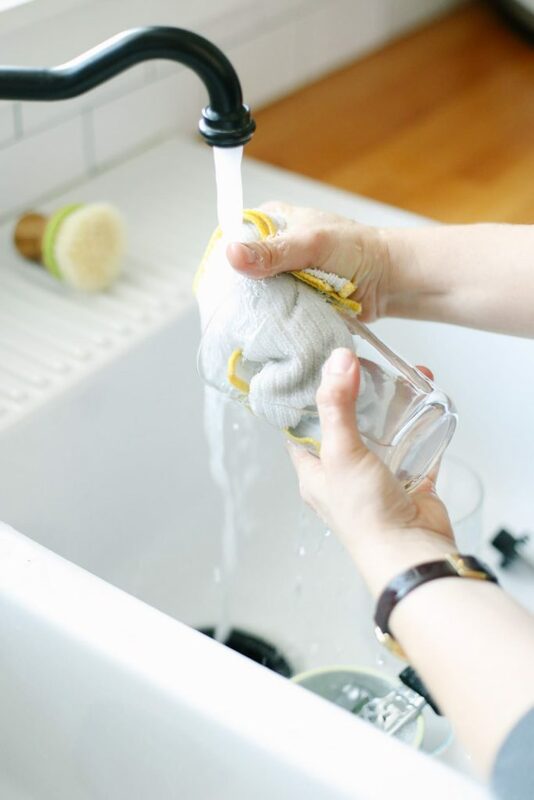 Natural cleaning isn’t something that’s meant to tricky, time-consuming, or complicated. Just about every single product that I use can be mixed together “on the spot” in less than five minutes. You may also notice that I’m not currently using every recipe on the blog to clean my home. 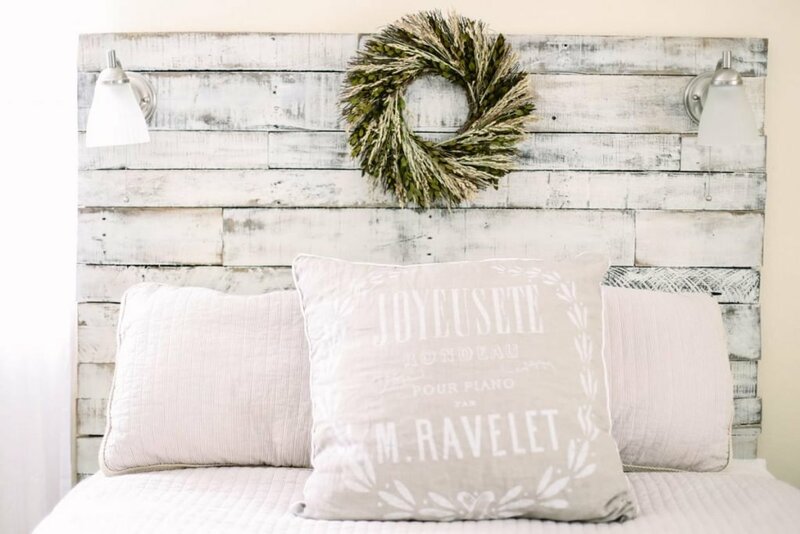 There are so many different ways to clean a home, and each recipe on the blog represents products I’ve used over the years and truly love. I pick and choose my cleaning products based on our current cleaning needs. I would encourage you to browse the cleaning archives on the blog (or download my cleaning book) to find the recipes that will work for your home and current cleaning needs. While I love making cleaners, I know there are seasons in life when making cleaners (or cleaning your home) just isn’t possible. Friend, it’s okay, I totally understand. If you’re interested in finding “cleaner” store-bought products, I highly recommend checking out the EWG’s Database. If you’d like to make or purchase natural cleaning products, but don’t have the time to clean and need to hire a cleaning service, I know from speaking with many different services in our area that some companies will allow you to provide your own cleaning products. Most of these companies also require that you sign a release form so they aren’t liable for product mishaps or usage issues. Switching to natural cleaning products doesn’t need to be complicated or exhausting. Simply start with the products you most often use in your home and start making one small change. Small, practical changes are the building blocks to a doable long-term natural lifestyle. I love this post, Kristin. I’ll be double-checking your recipes to make sure I’ve already got them all. I especially want to use your dish soap and toilet bowl cleaner recipes. For me, I’ve found what I consider the perfect all-around spray cleaner recipe: 1 cup white distilled vinegar, 1 cup distilled water, 12 drops tea tree essential oil, and 12 drops orange essential oil (a slight variation of Vanessa Romero’s recipe). It practically makes cleaning a pleasure. It works well on all my countertops, glass, stainless steel, and for general kitchen and bath cleaning. It also works well on my sealed tile floors. It’s brilliant, really. I always keep 3 spray bottles of it at the ready, in the kitchen and both baths. For laundry I use Seventh Generation liquid soap and wool dryer balls. The latter work beautifully and do not damage the interior of the dryer. Using 9 of these lovelies seems to the magic number. Plus, I finally just experimented with cleaning them, since I couldn’t find any advice online. I simply wash them in the machine in mesh bags, in hot water, along with some hand towels. Then I just dry it all together, and voila…clean wool dryer balls. For general dusting, I just use a dampened microfiber facecloth. It picks up all the dust (rather than just moving it around); it’s perfect for cleaning ceiling fans, for the same reason (plus, it’s the quickest way I’ve found to clean the fans). As I go, I rinse out the cloth, ring, and continue dusting. When I want to condition wood furniture I just use olive oil on a cloth. So far it works even better than Teak oil. We only have wood laminate throughout the house, so we stick with using manufacturer-preferred product to clean them. I would love to find a natural alternative to this type of cleaner, so if you have any suggestions, I’m all ears. Thank you again, Kristin. I’ll be re-reading this post to make sure I’ve noted all your excellent recommendations. Thank you, I’m so glad the cleaning tour was helpful! Thank you so much for sharing how you clean your home. I love to read about what other people are doing–it’s so helpful for me and the community. I’m going to try cleaning my wool dry balls per your suggestion–great idea! For laminate floors, I’ve looked at this particular recipe many times (through Google searches for other things): http://naturesnurtureblog.com/homemade-floor-all-purpose-cleaner/. The comments offer a lot of insight into the cleaner, too. Some people love it, some have modification tips. You’re welcome, Ardith! I would love to hear what you think of the cleaner. Love your blog, Kristen! You and wellness mama are really inspiring me to start one of my own. I would dearly love to see more grain free recipes from you. I use several of your products, and I am making some of my own. I found a really great recipe for an all purpose, disinfecting cleaner at cuperduper.blogspot.com that is basically an infusion of four thieves oil. She uses it for pretty much everything. Mixed with some white vinegar, this is a germ’s worst nightmare. I must say, I will be making lots of this, as it smells amazing and can be used on pretty much anything. I do use your glass cleaner, and I am thinking this thieves blend with a teaspoon of olive oil would be just the thing for dusting. I’m so glad you’re enjoying the blog! Are there any particular kind of grain-free recipes you’d like to see? We aren’t grain-free in our home, but I’m always up for trying out new recipe combos! Thank you for the suggestion. I’ll have to look into the thieves oil infusion; that sounds wonderful! I bet it would be great to add to the window cleaner–great idea! Love your blog, everything you have on it and post is like right up my alley and seems like you are seeing into my brain of what i needed to read about that day! Just awesome. 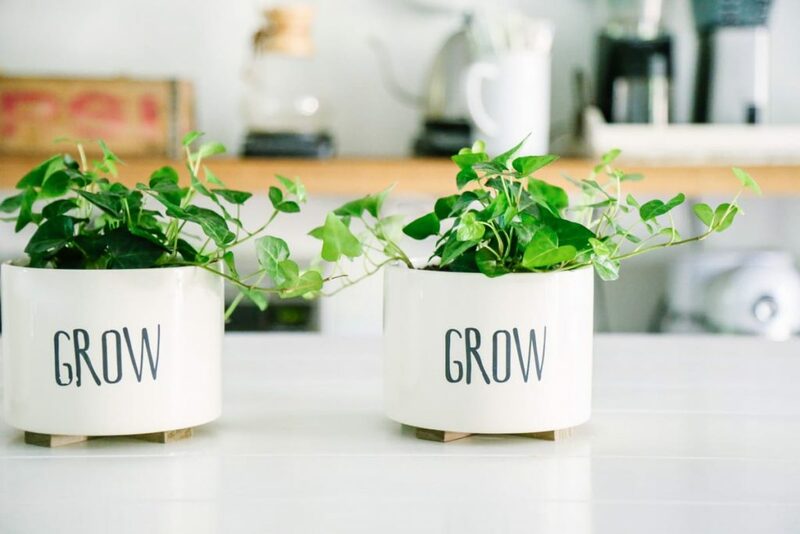 I really like the planters with the ‘Grow’ on the, can you let me know where you bought those? I have been looking online but unable to find them. That’s so great to hear, Amy! I’m so glad the posts have been so practical for you!! I bought those planters from Target (the dollar bins) a couple of months ago. They were $3 each. Maybe the Target website? Do you have real hardwood floors or engineered? I have engineered and I just don’t know what to clean them with. Other then sweeping because you are not supposed to get them wet. Frustrating. Hey Sharon, We have a tile floor that looks like wood. For engineered floors, I keep running into this recipe via my Google searches and it seems like many people have success with it: http://naturesnurtureblog.com/homemade-floor-all-purpose-cleaner/. I would definitely read the comment section of the recipe and test it in a small area over a few days. I was wondering reading your post if you had any recommendations regarding the types of wipes you use. Do you prefer microfiber? Also do you use a color code for your wipes (ex. the ones used for cleaning the toilet would be a different color than those used for countertops). Or do you use any other system? Thank You! Hey Catherine, Thank you so much. I prefer microfiber cloths, but also keep cotton towels around. Here are my favorite cleaning tools: https://livesimply.me/2015/11/05/10-must-have-tools-to-clean-your-entire-house-naturally/. I love your idea of color-coordinating the towels for cleaning. I haven’t tried that before. I just toss them in the wash after each use. Great idea!! Hey Anna, Which dish soap recipe? The one you need to cook, or the two ingredient one (Sal Suds, water, and optional vinegar). Did you use Sal Suds or castile soap? I love your blog, I’ve learned so much! Amazing is all I can say and thank you from the bottom of my heart. Could you please share a safe and effective DIY cleaning solution to use for my baby’s high chair? Hey Linda, I’m so glad you’re enjoying the blog! 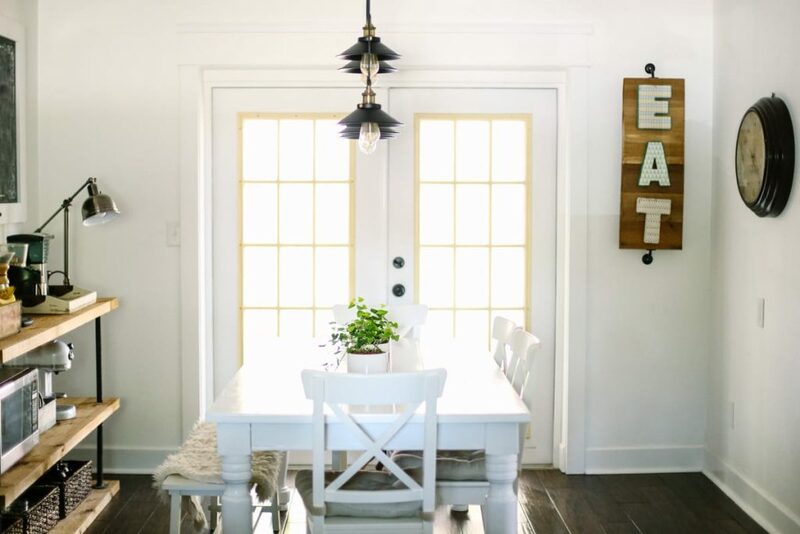 I would use the vinegar or castile soap all-purpose spray for a high chair: https://livesimply.me/2015/11/02/how-to-make-homemade-all-purpose-surface-cleaner/. I’m gonna try that toilet cleaner, I hope it works well for me.